Although the world’s brightest scientific minds are steadily working to get there, a viable option for settling Mars is still just beyond our grasp. So, in the meantime, it’s important to focus on taking care of the planet we already have. 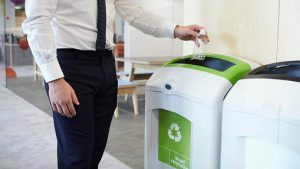 So, if you’re considering going green in 2019 in your workplace, here are a few ideas to help jumpstart your planning. According to RoadRunnerWM.com, “the average office worker generates about two pounds worth of mixed paper products every day and uses about 10,000 sheets of paper each year.” Additionally, “70% of the total waste in offices is made up of paper.” Relying more on digital technologies for many of your office paper activities, such as memos, newsletters, file storage, and snail mail, can greatly reduce your company’s impact on the environment. There are also a wide variety of digital asset management tools available today that can help your office rely less on paper and move many of your processes into an electronic platform. For every ton of paper that is recycled, 17 trees, 7,000 gallons of water, 3.3 cubic yards of landfill space, and 4,100-kilowatt hours of energy are saved. To make recycling a company priority in the new year, place recycling bins in easily accessible areas throughout your building and establish protocols for how you dispense with waste, especially hazardous waste items like batteries, chemicals, or printer toner. And, be sure to discuss with your employees what items can and cannot be recycled. Education is the key, as many employees may not even know how much of the waste they produce in a typical workday can actually be recycled. When you are away from your desk for extended periods of time or when you leave in the evening, take a few extra seconds to turn off lights, shut down computers or put them in sleep mode, and turn off any other non-essential machines around the office. The Energy Information Administration estimates the annual energy costs for U.S. commercial and industrial buildings to be $202.3 billion. So, remembering to shut them down not only reduces energy usage, but it also helps save money. From recycled copy paper to reusable cups, take a look at the things you use every day to see if there is a suitable green alternative. Vegware, for example, produces an extensive line of compostable and recyclable products including coffee cups, plates, and flatware. You’d be surprised how many of the things we use around the office can be substituted with environmentally friendly options. It’s also a good idea to incorporate Energy Star rated office machines into your business. It’s probably not cost effective to replace them all at once, but as your copiers, printers, and breakroom appliances reach the end of their useful life, consider more earth-friendly replacements. One great way to encourage employees to help reduce their impact on the environment on their way to and from work each day is to help organize carpool groups. According to The Rideshare Company, the average car “consumes 550 gallons of gas, and emits 80 pounds of hydrocarbons, 606 pounds of carbon monoxide, 41 pounds of nitrogen oxides, and 10,000 pounds of carbon dioxide.” To help make a positive impact on the environment—and your wallet—consider implementing a carpooling program in your office. Sharing a ride to work not only helps you reduce your carbon footprint and save money on gas, but it’s also a great way for coworkers to build stronger working relationships. What are some ways you plan to go green in your workplace in 2019? What are some recycling initiatives you already have in place? Let us know in the comments section below. The Results Are In: How Would You Describe Your Company’s Holiday/Christmas Party? If you have a Keurig coffee maker, using re-usable cups is a HUGE way to reduce the amount of plastic disposal. Sure it requires a bit more effort to empty the re-usable cup but the reduction in plastic to the environment is worth it. It’s also much more cost-effective and the grounds can be saved to spread on gardens.